Total donations, as of Jan. 4, 2016, are $351, 484. The Bulldog Pride Fund is an endowed scholarship that was established in 2006 under the auspices of the Fresno State Alumni Association: "To support students attending Fresno State." As of this fall, we have awarded 41 scholarships valued at $75,000. Total donations, as of Jan. 4, 2016, are $351,484. THANK YOU DONORS AND FRIENDS! 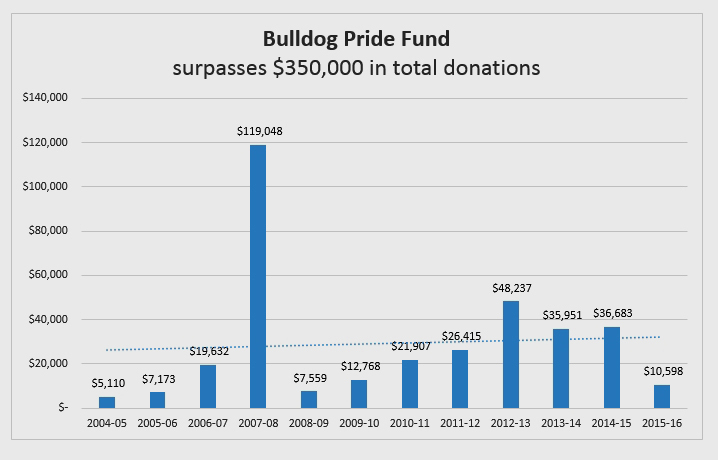 It was just 10 years ago the the Bulldog Pride Fund was established with two $50 donations. As of Dec. 15, 2015, our total donations have surpassed $350,000. Thank you for your continued support of and investment in Fresno State students. Copyright © Bulldog Pride Scholarship Fund, All Rights Reserved.